A collection of links to our Bugatchi Uomo mens long sleeve knit shirts from the fall 2013, winter 2014 collection. These items are in stock now and include polo, self collar and half zip. All shirts are available in sizes medium to 2XL. Bugatchi 1000 series. This ultra smooth and soft modal rayon blend is available in a wide variety of colors, and in long sleeve seasonally. It drapes beautifully and is often worn apres golf. Bugatchi 100% pima cotton self collar long sleeve shirt. The most popular shirt of the season, with many solid colors to choose from. 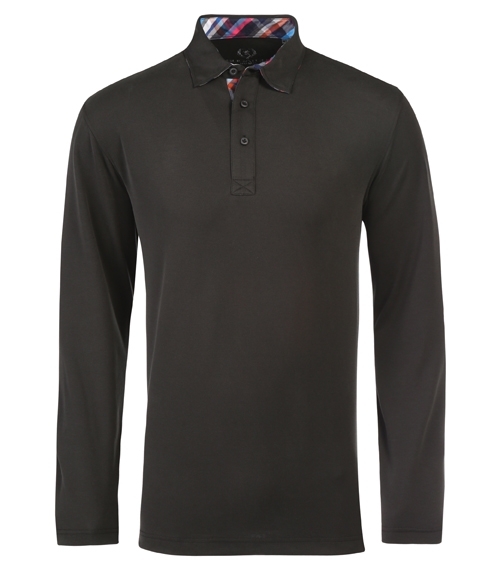 PCF1520K52 L/S – THREE BUTTON SELF COLLAR. Bugatchi men’s fancy knit shirt, long sleeve PF2005F77. New, cotton with a touch of spandex for flexibility. Colors bordeaux, cement, plum. Bugatchi men’s fancy knit shirt, long sleeve PF2015F48. Bugatchi men’s knit half zip long sleeve mock neck with contrast by Bugatchi Uomo. These have leather like shoulders. Bugatchi men’s knit half zip long sleeve mock neck with contrast by Bugatchi Uomo. These are the same fabric as above, but have a dark tonal contrast on shoulders. Does Bugatchi make men’s half zip short sleeve golf shirts? There are no current season half zip short sleeve golf shirts. Shirt styles and colors change every season. The Fall and Winter season features long sleeve shirts and the Spring and Summer season features short sleeve shirts. We will have Bugatchi Uomo short sleeve golf shirts with zipper coming in April 2013. To advance order and see dozens of colors available, please contact us.